Divers should know that while the decompression algorithms in dive computers are great at measuring pressure-time profiles, they are blind to a wide range of variables that affect decompression risk. The approximation of decompression status predicted by current deterministic algorithms should not be confused with 'truth,' even though they can provide reasonable guidance under normal circumstances of relatively conservative exposures. The next problem is determining what is really 'conservative.' The complex interplay of exposure, individual status, and individual response makes it difficult. Decompression stress is largely determined by inert gas uptake and elimination. The dive profile is clearly the chief determinant of this, but thermal status and exercise intensity at various phases of a dive can have major influence. Individual characteristics, which can increase or decrease susceptibility to insult, play a complex wild card role. Since people rarely know their sensitivity, on either a chronic or an acute basis, there is an element of chance in the safety of any exposure. Half-times, tissue compartments, and M-values are described in more detail in the article mentioned previously.1 Briefly, half-times mathematically describe the rate of inert gas equilibrium during exposure to elevated or reduced pressure. Each half-time represents a theoretical tissue compartment construct, not an actual tissue. A range of half-times, covering fast through slow equilibration, is used to predict uptake and elimination of gases throughout the body. Supersaturation is the state in which the gas concentration (tension) in a tissue is higher than the surrounding pressure. Supersaturation exists when a diver ascends and the ambient pressure falls. The term 'maximum value,' or 'M-value,' was coined to describe the theoretical level of supersaturation a tissue can tolerate before an orderly elimination of inert gas is replaced with a disordered outcome. Individual tissues may have different M-values and, in the fundamental sense, the disordered outcome in any tissue can be thought of as a decompression insult. Experience has shown that bubbles can form and decompression sickness can develop when supersaturation is within established M-value limits. This indicates the imperfection of simple limits. In response, many dive computers offer some degree of user-selectable conservatism. Conservatism can be important for both physical safety and psychological comfort. The person who believes himself or herself to be bends-resistant may be happy with settings that would not be comfortable for a person less confident about being bulletproof or one simply wanting additional peace of mind. The actual effects of conservatism schemes are often poorly described by manufacturers or marketers. Some even include poorly thought out descriptions of conservatism levels that play on the vanity of divers, with potentially adverse effects on decision-making. One conservatism construct, gradient factors, stands as a method that is fairly easy to understand, easy to quantify, and relatively free of descriptive bias. Gradient factors, in the simplest sense, allow exposure limits to be adjusted to become a fraction of other limits. The mathematical power of dive computers allows numerous half-times to be tracked simultaneously, letting any that reach the assigned limit become the leading, and effectively the controlling compartment. Gradient factors are commonly applied to the Buhlmann algorithm, a well-researched set of decompression procedures that were openly released to the community. The open release allowed for all aspects of the algorithm to be studied carefully by many who ultimately contributed to corrections in subsequently revised versions. 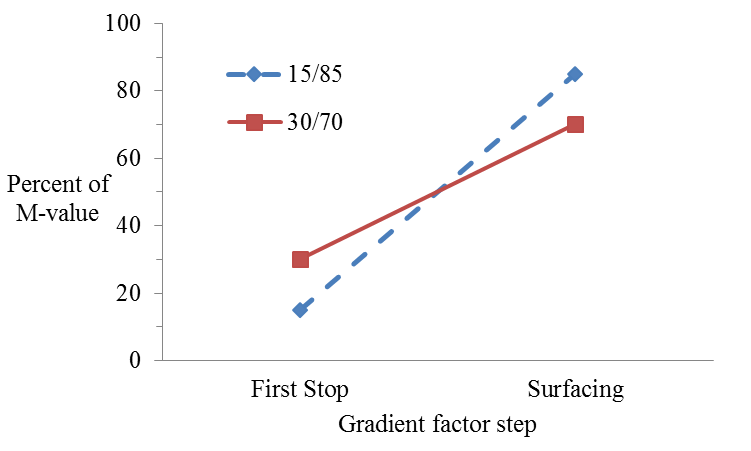 Gradient factors are typically applied in two steps. The first number (GFlow) represents that percentage of the M-value used to determine the first stop during ascent. The second number (GFhigh) is the percentage of the M-value that cannot be exceeded at any point during surfacing. The dive computer effectively draws a straight line between the two, creating the ascent slope. The alteration of limits is applicable to both technical and non-technical exposures. Gradient factors adjust the limits displayed on the computer screen. Low GFlow values (e.g., ≤20) are for those who believe in deep stops. Higher GFlow values (e.g., ≥30) get divers off the bottom to reduce inert gas uptake in tissues that are not saturated. Low GFhigh values (e.g., ≤70) limit the maximal decompression stress experienced on the dive. High GFhigh values (e.g., ≥80) get divers out of the water quickly. Fully adjustable gradient factors, which includes the ability to change GFhigh during a dive, provide a great deal of control. If an unexpected amount of work or excessive warmth was experienced during the descent or bottom phase of a dive, GFhigh could be reduced to prolong the ascent. If part of a critical gas supply was lost during the dive, GFhigh could be increased to expedite the return to the surface. One practical note is that adding extra shallow stop time is not the same as reducing GFhigh. 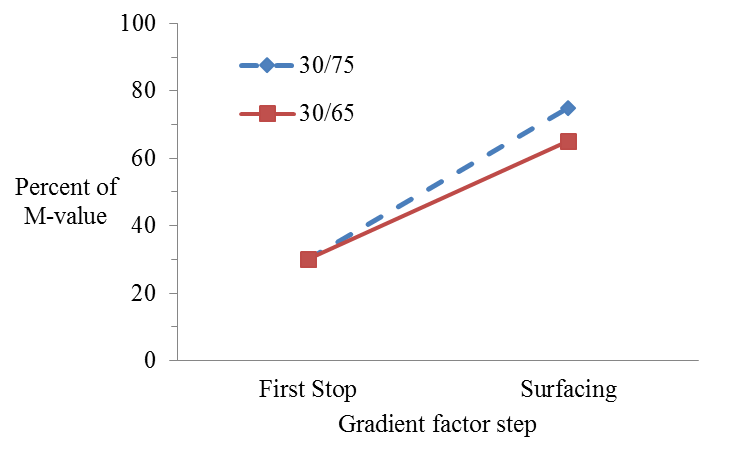 Extra shallow stop time will reduce the effective GF at the point of surfacing, but higher effective GF values could have been reached earlier during ascent. The impact of reducing GFhigh is greatest near the surface, but it will moderate the ascent profile throughout. Extra shallow stop time provides additional protection and is well worthwhile if time, gas, and conditions allow. The thoughtful and well-informed diver knows that conditions during a dive affect real-time risk. Having a dive computer that can help manage exposures to keep them within zones of comfort can also help ensure good outcomes on every dive. Pollock NW. Gradient factors: a pathway for controlling decompression risk. Alert Diver. 2015; 31(4): 46-9. Neal Pollock is a research physiologist in Durham, North Carolina. His academic training is in zoology, exercise physiology and environmental physiology. His research interests focus on human health and safety in extreme environments. He is actively involved in studies of diving and freediving safety, astronaut decompression and ultrasonic assessment of decompression-induced bubbles. An excellent, thoughtful consideration as always from Dr. Pollack. Terrific article! A straightforward and informative description of gradient factors and algorithms for all of us: guinea pigs! A great explanation of M-values and deco computation! A clear explanation of M-values and deco computation. Thank you Neal!! Can I use this article for a diving review in my country. This is a brilliant, concise presentation of information that serious divers need to consider, and it is why I dive Shearwater. I have only recently started to research gradient factors and how they apply to my diving and dive computer (Petrel2). My understanding is gradient factors can and should be changed based on the breathing gas (air, nitrox, or trimix) in addition to the anticipated decompression stress during the dive. Has Divers Alert Network or another entity done any research into a good set of gradient factors for the Buhlmann model to use as a baseline for the various breathing gases? From the baseline gradient factors could be adjusted based on the diver’s age, physical fitness level, and personal comfort level. The decompression algorithms in dive computers enabled for different gases make adjustments for each gas based on available data. Gradient factors serve as an overlay function; proportionally adjusting the computed limits. Assuming adequate validity of the source data used in the algorithm, a given GFhigh, for example, might be expected to have a similar effect for any breathing mixture. This assumption may not be completely valid, though, since the available data is variable. If new data leads to the adjustment of algorithms to standardize risk then a fixed gradient factor application would be reasonable. If increased risk with certain gases or exposures is seen but not addressed by algorithm revision, gradient factor tailoring could be useful. Similarly, if factors not interpreted in a meaningful way by the algorithm may be important, such as increasing age, decreasing fitness, extreme work rates, etc,, adding extra buffers is smart. Ultimately, where doubts exist more conservatism is warranted. I would like to see a dive computer which allows two sets of gradient factors to be selected. One would be the preferred ascent/decompression profile, which would display data based on the user’s preferred conservatism, and the other would be the emergency profile, which would be the least conservative profile the diver finds acceptable under the conditions of the specific dive. The display should show the diver where they are on both profiles in real time. Do you have any comment on the utility of such a system, and on the technical feasibility of implementing it? The dual graphic display would be straightforward (two ascent profile lines and a third line to show the secondary decompression ceiling), but it would be more challenging to have simultaneous numerical display (crowding and excessive display element issues). Practically, you can access the same information now on dive computers with adjustable gradient factors by changing them during the dive to see the impact. I can envision the day when a manufacturer makes an alternative display option where a single button push allows you to toggle between two profile plans. I am evaluating the variance in dive profiles while utilizing a perdix & teric with different gradient factors selected in each. This is the most well written article I have read about GF, but I am still left a void in knowledge. The article, as with others I have read seem to orient around decompression diving. When I am diving recreationally with no-deco, the varying GF’s in my 2 computers vary my NDL considerably. Based on this, I believe the GF is applied at all times, not only on ascents while in deco-mode; correct? I dive my shearwaters in OC/TEC whether I am diving rec or tec. I keep one on default 30/70 and the other I vary just for understanding & awareness; two things I am still struggling with. Hello, Michael. While you are correct when you say that the GF is applied at all times, it is important to clarify that for dives within the NDL only GF High is relevant — the 70 in 30/70. During the dive your computers will continuously simulate an ascent to the surface monitoring that your simulated GF at the surface is 70 or lower. If that is the case, then your dive is within the NDL. If that is not the case and the simulated GF at surface is higher than 70, then you are outside the NDL and have to make mandatory decompression stops. The first, deeper stops are dictated by the GF Low of 30 in your 30/70 setting. I hope this clears things a bit.